Loopmasters proudly welcomes the Benjamin Pedersen AKA Kid Massive to our Artist series with a mammoth 1.8GB collection of 10 club shaking song kits suitable for all Main Room House and EDM producers. Proudly flying the flag for Denmark and electronic music, Kid Massive has had quite the impressive career to date. With productions supported by dance elite such as Tiesto, David Guetta, Nicky Romero and Hardwell, Kid Massive’s stock as a DJ/Producer/Remixer is very much on the rise. His signature sound of driving and often vocal-driven big room house has appeared on a host of major dance labels including Revealed, Strictly Rhythm, Mutants and Harem, whilst also being stamped on remixes for Sony Music artists in the UK, Australia and Japan. KM’s releases have been prominent fixtures on Beatport, Australian ARIA and UK Club Charts, with airplay on national and global radio stations like BBC Radio 1 in the UK and Sirius FM in the US, further cementing the Dane’s position as an important part of the EDM scene. “I was really excited about being asked to create this sample pack for Loopmasters, as I have been a huge fan of their products for a long time. My approach to creating these kits is exactly the same way as when I make my own Kid Massive material. I always start with the main hook / groove and then build on that if i feel it works. This collection focuses on big room EDM tracks but I have also added a few driving tunes with a more techy edge, I love to mix it up and this pack is a great reflection of what you would hear in my DJ sets, lots of hooks, big drops and driving beats”. Massive by name and massive by sound, this is one dance act that is ready to live up to his title. 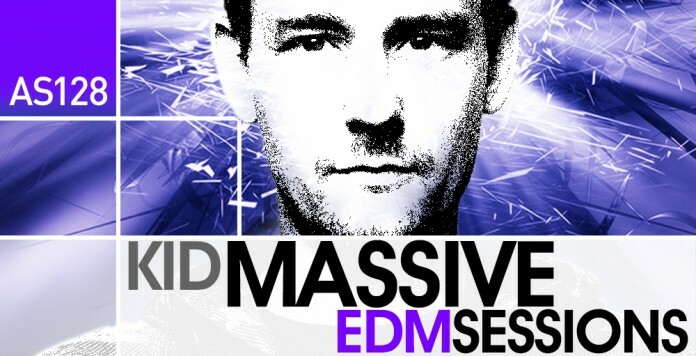 If you’re looking for powerful club ready sounds and samples that reflect the current sound of EDM you need to check out this collection, so load up the demo songs and sample Kid Massive – EDM Sessions TODAY! Click here for more info and download.